Labor and Public Employees Committee lawmakers listen on Thursday during public hearing testimony regarding paid family and medical leave legislation. When New Haven resident Sarah Locke was diagnosed with cancer in her late 20s she quit her job and her mother stopped working, drawing no pay, while she underwent surgery and treatment. Locke was among a list of people who submitted written testimony in support of revived legislation that would adopt paid family and medical leave statewide. 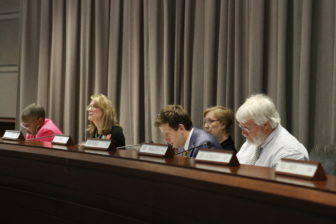 Members of the legislature’s Labor and Public Employees Committee on Thursday heard hours of testimony from those for and against bills to establish a paid family and medical leave system in Connecticut. The measure has become a linchpin agenda item for Democrats who now hold majorities in both chambers. Under the proposed law, workers would be guaranteed up to 12 weeks per year of paid leave to care for an ill family member and could not be dismissed for taking leave. The benefit would be equal to 100 percent of their pay – up to a maximum of $1,000 per week. Paid family and medical leave would be financed exclusively through a new payroll deduction on all workers in Connecticut, according to Rep. Robyn Porter, D-New Haven, co-chairwoman of the committee. Although the details are still being negotiated, workers would be charged roughly one-half of 1 percent of their pay to fund the family and medical leave system. As other legislators, advocates, and residents testified on the bill, committee lawmakers on both sides of aisle made their case and aired concerns. 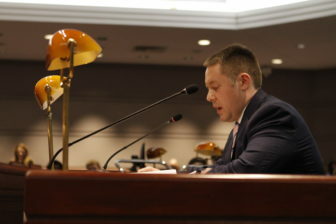 Eric Gjede of the Connecticut Business and Industry Association testifies before the Labor and Public Employees Committee on Thursday. Supportive lawmakers sparred with Eric Gjede of the Connecticut Business and Industry Association, who said the bill would hurt businesses with immense costs and force them to deal with absences in their workforce. Gjede said CBIA does support employers that voluntarily adopt their own paid family and medical leave programs. “But what you’re asking from us to take on in these two bills in terms of cost and burdens simply cannot be done by a significant number of Connecticut’s small businesses,” Gjede said. Ppeople are absolutely terrified of this bill and the costs associated with it,” Gjede said. Porter pressed Gjede on whether he had inquired about other states that have adopted paid family and medical leave programs and said the issue was a matter of life and death in many cases. State Sen. Craig Miner, R-Litchfield, said the bill is not sustainable because there may be people who use it more and others who use it less. The senator said the regular communication he has received from concerned employers about the bill shows there is significant amount of trepidation. University of Connecticut senior Jessica Weaver said the bill is important to her because she would like to settle down and build a family in Connecticut. “I support this act and I believe it will undoubtedly help in reversing this brain-drain that we’re seeing and I know a lot of my fellow millennials slash Gen Zers in this state really do support a place where we can have an attractive workforce, where we do have this option for paid family medical leave,” Weaver said.